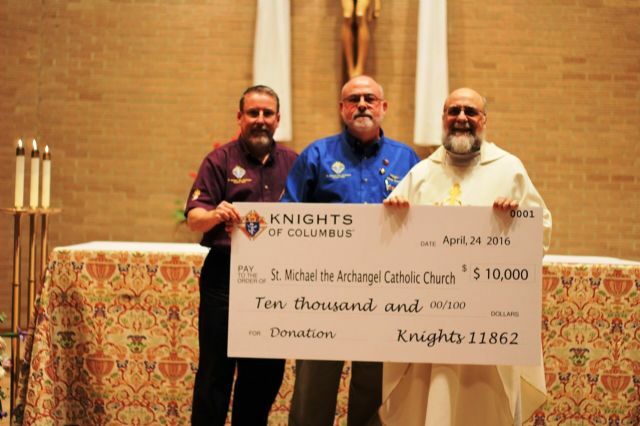 Grand Knight, SK Mike Courtney (center) and DGK SK Chris Fowler (left) at Council 11862 present a generous charity check to Council Chaplain, Rev. Joseph A. Mehan, Jr., pastor of St. Michael the Archangel Catholic Church in Garland, Texas. The council consulted with parish staff and Fr. Joseph to focus on how the council can help with several capital projects. The funds presented will support: 1. Audio/Visual Equipment for Sanctuary of St. Michael The Archangel 2. Storage Facility on the parish grounds Grand Knight Mike Courtney is also grateful to his council for the support they provide to the parish throughout the year and the work put forward to generate funds that allow us to support St. Michael the Archangel and other parishes in our diocese.